The acceptable moisture levels in wood depend on the final use of the wood, the type and thickness of the wood, and the average relative humidity (RH) in the environment where the wood is to be used. Based on common guidelines or recommendations, the acceptable moisture level for wood objects used indoors is generally 6% to 8% for wood flooring, 6% to 9% furniture, and 9% to 14% for construction. Understanding the basics of how wood interacts with moisture is essential for anyone who works with wood – be it a woodworker, wood flooring professional, or construction professional. Wood is hygroscopic. This means it gains or loses moisture as the RH of the air surrounding it changes. 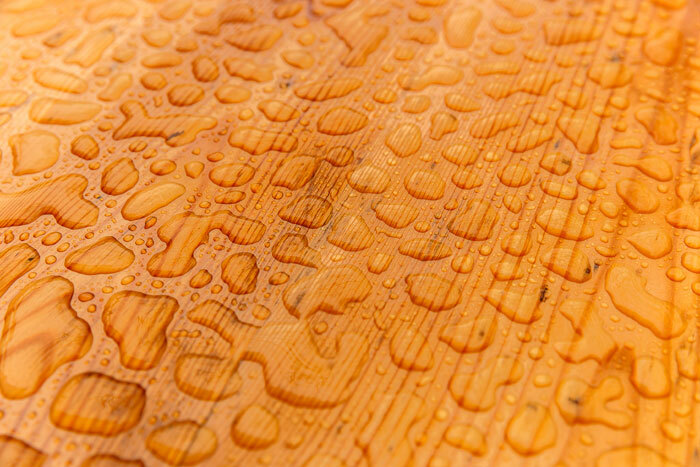 As the humidity increases, the moisture content (MC) increases, causing the wood to expand. As the humidity decreases, the MC decreases, causing the wood to shrink. When the wood neither gains nor loses moisture, we say that the wood has reached its equilibrium moisture content (EMC). Dr. Eugene Wengert, professor and extension specialist in wood processing, Department of Forestry, University of Wisconsin-Madison, says it is critical that the wood to be worked on should be dried down to a MC within 2 percentage points of the EMC of the in-use location. “The EMC of air is numerically equal to the MC that will eventually be attained by any piece of wood when stored indefinitely at a particular humidity,” notes Wengert. This is important to know. For instance, if a woodworker brings home kiln-dried wood with a MC of 8% and then stores it in his garage, that wood could absorb another 6% or more of moisture. Depending on how he plans to use the wood, he must allow the wood to come in balance with the average RH at the location where it will be used. The end-use of a wood product is one of the key factors – along with RH – in determining the acceptable MC. Failure to allow the wood to acclimate or come in balance with the RH at its end-use location will result in warping, cracking, and other problems after the wood product is constructed. 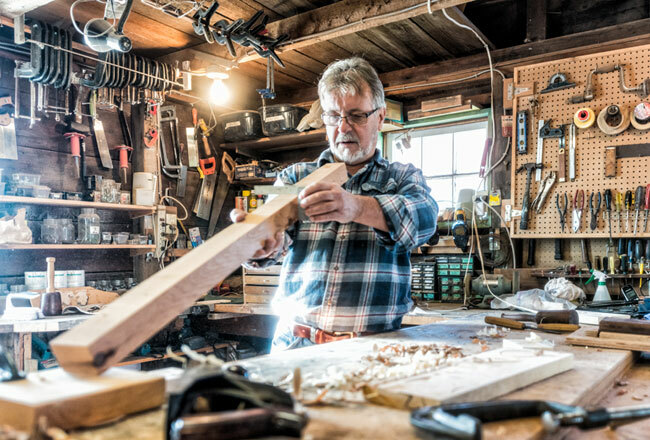 Bird, who runs the School of Fine Woodworking outside Knoxville, Tenn., says he knows wood will shrink seasonally, but he wants to minimize that shrinkage and expansion by drying the wood to a MC of about 8%. To make certain the wood is properly dried, he uses a moisture meter before working on it. 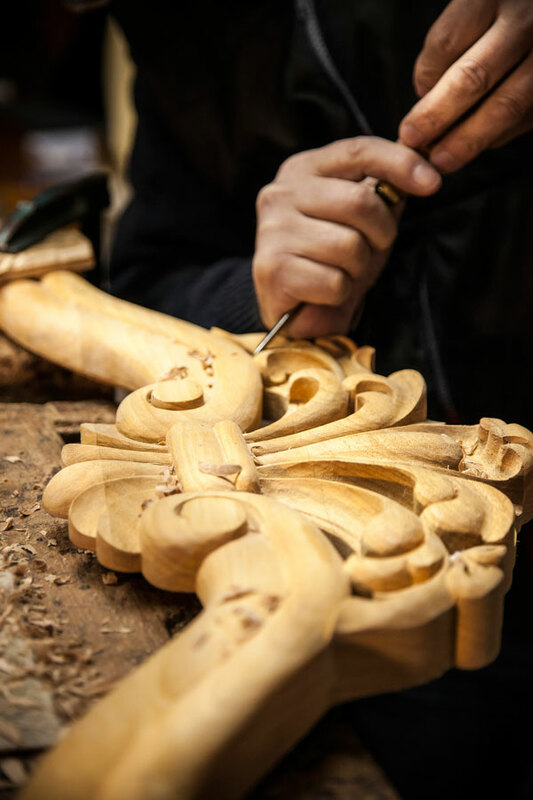 For woodworkers who build cabinets, fine furniture, musical instruments, dishes, toys, and pieces of art, among other things, the acceptable moisture level of wood normally ranges from 6% to 8%. That range can vary slightly depending on the region of the country where RH can either be very high or very low. Thus, if an interior location has an average RH of 40% to 52%, the wood placed in that location will average 8% to 9% EMC (based on a chart from Wood Handbook: Wood as an Engineering Material). A woodworker building a cabinet for that same interior environment would then have to dry his wood to 8% to 9% MC before and during construction to avoid post-construction problems. The key to ensuring the wood is dried properly, therefore, is to be aware of the RH in which the wood will be kept and to use a moisture meter to accurately determine the wood’s MC. The National Wood Flooring Association (NWFA) has specific installation guidelines for wood flooring and how they relate to MC. When determining the acceptable moisture levels in wood flooring before installation, NWFA states that the flooring professional should establish a baseline for acclimation. Acclimation is the process for conditioning the MC of wood flooring to the environment in which it will be installed. To establish a baseline for wood flooring acclimation, the installer will need to calculate the optimal moisture level of the wood by dividing the region’s high season and low season EMC. For example, if the expected EMC ranges from a low of 6% to a high of 9%, the baseline MC of the wood would be 7.5%. The installer should then check the MC of multiple boards and average the results. A high reading in one area indicates a problem that must be corrected. A good representative sample is typically 40 boards for every 1,000 square feet of flooring. If the MC of the boards is near 7.5%, no acclimation is required. But if the MC of the product is well outside the range of optimal MC, the wood flooring should not be accepted as it will lead to shrinkage, bowing, cupping, and other physical problems. For example, if the MC of the delivered wood is 12% and the optimal MC is 6%, then physical problems will occur during the acclimation process. To avoid this problem, wood flooring should never be stored where environmental conditions are uncontrolled, such as garages and exterior patios. As a general rule, with geographic exceptions, wood flooring performs best when the interior environment is controlled to stay within a RH range of 30% to 50% and a temperature range of 60 to 80 degrees Fahrenheit. However, the ideal humidity range in some climates may be higher or lower, such as 25% to 45% or 45% to 65%, for example. The NWFA has a chart that indicates the MC of wood at any given combination of temperature and humidity. The EMC in the recommended temperature/humidity range coincides with the 6% to 9% range used by most flooring manufacturers during the manufacturing/shipping process. Although some movement can be expected between 6% and 9%, wood flooring can shrink or swell more dramatically outside this range. Installers should also measure moisture in wood subfloors and concrete slabs as they, too, can affect the wood flooring. The maximum subfloor moisture level for solid strip flooring or wide-width solid flooring is either 12% or 13%, depending on the manufacturer. According to the National Association of Home Builders’ Green Home Building Guidelines, solid strip flooring (less than 3” wide) should be no more than 4% MC difference between properly acclimated wood flooring and subflooring materials. For wide-width solid flooring (3” or wider), there should be no more than 2% difference in MC between properly acclimated wood flooring and subflooring materials. For most areas of the United States, acceptable moisture levels of wood can be in the range of 9% to 14% MC for exterior wood or building envelope components within constructed assemblies. Wood MC in this range, therefore, is considered sufficiently dry for exterior in-service wood. Using wood with a MC above 14% MC may have deleterious long-term effects on the construction and is not recommended. According to M. Steven Doggett, Ph.D. LEED AP, the founder of Built Environments, Inc., wood MC as high as 15% can cause corrosion of metal fasteners and at 16% may lead to fungal growth. If you’re checking the moisture content of plywood or dimensional lumber: 17% to 19% reduces the overall strength of the plywood, while a MC of 20% or greater reduces the strength of dimensional lumber (lumber cut to certain pre-defined sizes, such as 2x4s). A study by Imamura and Kiguchi (1999) showed that wood MC in excess of 20% can cause a 5% loss of nail shank diameter in four years and a projected 25% loss in 30 years. The same study showed 40% loss in joint strength and concluded that 20% MC may significantly compromise shear resistance of exterior walls. When exposed to a constant RH, the MC of wood will come to equilibrium with its environment, resulting in an EMC for that species of a wood-based composite. The EMC of wood exposed to an outdoor atmosphere varies across the U.S.
For instance, in the coastal city of Seattle, the EMC of wood is higher than the EMC of cities inland or in the Southwest. Seattle’s EMC ranges from 12.2% to 16.5%. In the Midwest, the EMC of wood in Des Moines, Iowa, ranges from 12.4% to 14.9%. In contrast, Las Vegas in the drier Southwest has much lower EMC percentages than most other U.S. cities. The Las Vegas EMC of wood ranges from 4.0% to 8.5%. Based on common guidelines or recommendations, the acceptable moisture levels for wood objects used indoors is generally 6% to 8%; for wood flooring, it’s 6% to 9%; and for construction, it’s 9% to 14%. Keep in mind, the acceptable moisture level in wood depends primarily on the final use of the wood and the average relative humidity at the place where the wood is to be used. Other factors may include the wood species and the thickness or size of the wood. In all cases, determining the acceptable moisture level of wood requires the use of an accurate moisture meter. Failure to allow the wood to acclimate or come in balance with the RH at its end-use location will result in any number of moisture-related problems in the wood – including warping, cracking, buckling, diminished wood strength, corrosion of fasteners, and even fungal growth after the wood product is constructed. Shop our wood moisture meters and see which one would be the best fit for you. I so appreciate your treatise on this issue. My question for you is: after a smallish unheated underground space (similar to a basement, i.e. all concrete) is framed and sheetrocked (though not mudded or sealed in any way) is then the studs are tested for humidity, what would be a reasonable level here in Seattle, living approximately 100 yards Puget Sound? This building was constructed around 1966 and this little space appears very dry, in spite of a recent leak from an nearby hot water tank. The company they hired measured 47% in the ‘wood’ and declares that this must be ripped out and replaced. Sorry that this is so long-winded and I thank you in advance if you are willing to address this question for me. Standard construction studs such as 2×4 and 2×6’s are typically dried to 19% moisture content before they are installed. Any moisture content measured higher than that might result in movement, such as warping and twisting, once it dries. Also, there is a risk of mold. A wood moisture content of 47% is too high. We are manufacturer of eng wood flooring. My first question is how to determine the MC of eng wood flooring which composite of different species layer, face and different species to form plywood core. 9mm thick plywood compose of 7 layers, 2 layers acacia, 4 layers of Eucalyptus\2 layers Acacia and one layer Poplar. In this case, what Built in # that I can use to measure flooring. 2nd question, will lacquer on surface of flooring affect the reading. Many of our customers are successfully using our hand held moisture meters on engineered flooring. The thinner veneers won’t have much bearing on the reading. Set the meter to the species that makes up the bulk, in this case, the plywood. The plywood setting is .57. Lacquer will not make a reading difference as long as there are no metallic components in the lacquer itself. Hi, we live in a coastal area, had a recent water leak, and a hard wood floor MC is measuring about 25% – the water did not contact this area directly. in other hardwood areas that wasn’t close to the water, was measuring about 16-19%. our question is do we need to replace the floor to avoid fungal problems? A moisture content reading of 25% is borderline to support mold. You should be ok as long as the moisture content does not get worse (higher). Keep monitoring it. Larry: I recently had my annual termite inspection. The inspector said his meter reading taken from my basement on subflooring/joists/framing was too high. (He didn’t cite a figure.) He added that plastic sheet ground covering that his company laid over my crawl space had been moved in spots and that I no longer had full coverage. I live in upstate South Carolina. We have had an abnormally wet spring and part of summer. I suggested replacing my dehumidifier (Sears brand, bucket collection) which has been inoperable this past year. He, of course, said that type of product is insufficient. He wants to install his company’s system, seal all external openings around connections, etc. for a mere $4900. My house was built in 1927. I get some water seepage through an exterior wall at basement floor level as a result of heavy rain. It is a 2-3 feet wide wet area that drains to a line connected to the city system. Generally the entire floor is dry. The air vents stay closed year round. What do you recommend? Jerry, From a moisture standpoint, water in the basement can over time absorb into your subfloor. I don’t know what type of floor you have, but if it gets wet enough, about 25% moisture content or higher, mold can grow. Doesn’t sound like this has been a problem in the past. I would think at least fixing your dehumidifier is a must. My potential house in North Carolina Fayetteville area was just checked for moisture content in the crawl space. The levels were between 20 and 23%. The house was not in the flood area however they did receive 20 inches of rain. Do these levels seen appropriate considering the recent rainfall. As long as the moisture content does not exceed those readings you should be ok. Mold starts to grow in the mid to high 20 percent moisture contents. I am having a section of our 3.25″ Maple hardwood floor replaced. About how long do you think we should allow the new wood to acclimate in the end use environment before installing it? Typically, allow about 3 weeks for hardwood to acclimate in the environment. Two weeks is sufficient for softwood. My house is 24 years old. 18 years ago the moist content (MC) of the beams and joist was 24% in an area of the crawl space that floods in spring. I installed a sump pump and 6 mil vapor barrier, but the barrier is not sealed around piers and the ground is moist under the barrier all year. I was able to get the MC down to 15%. I also applied Boracare (boron) that has stopped minor beetle damage. Three years ago, the floor sank in a heavy traffic area and an engineer told me Masonite was used to shim and had compressed. Over a year ago, I re-shim all the piers with metal shims. The floor immediately felt stronger. Prior to the re-shim, the pier in the area that floods in the spring could be felt pushing up the floor, meaning the beam is warping and been monitoring it. This week, I notice the next pier on the same beam is starting to push up, warping the floor. Knowing were all the piers are, I can stand on top and feel a small hump in the floors. You can hardly see the humps except the first pier that popped up ¼”. I had a quick looked around the crawl space and didn’t notice any structure damage. I not sure if this is normal, related to the re-shim or need to install a crawl space dehumidifier to slow the progression? A dehumidifier in the crawlspace will help but can be expensive. The purpose of the vapor barrier is to keep moisture away from materials that expand and contract. Perhaps try to seal the vapor barrier better around the piers. The other thing to consider is examining how water is entering your crawl space. Perhaps better drainage around your house will do the trick… or treat. Sorry, that time of year. Is your electrical outlet that is 3 inches above the floor inside the house? Water was coming out of this outlet and onto the floor? If that is the case you need to remove the flooring and examine the subfloor. You should be able to tell where the water reached the subfloor because it will be discolored and may also be swelled up. Moisture contents of 12 to 17% is ok. You don’t want to see any subfloor reach about 25% which is where mold will start to grow. I am renovating my kitchen and installing hardwood floors. The floor installer put the floors down without allowing the boards to acclimate. When questioned, he said because Room is under 200 sq feet it is not a problem. Is this accurate? That doesn’t make much sense to me. The purpose of acclimating is to allow the flooring to equalize to the surrounding conditions, no matter how large the room is. Be on the lookout for flooring failures such as swelling, buckling, cupping, etc. If any of these conditions occur, tell your installer right away. Should you check moisture levels on a trailor floor on a massive rainy day? Will the reading be accurate? Any time water can be absorbed into a material such as wood, drywall etc, it’s always a good idea to check for excessive moisture, especially if you suspect a leak. Other than causing structural damage, too much water can result in mold growth. If a wooden sample has moisture content range of 2-6% only and if it has moisture content of 9 or 10% then what does this mean?? Mobeen, If a wooden sample gains moisture, then the sample will increase in size. This can be a problem once installed in furniture or a floor. It is best to allow the wood to equilibrate to the room environment. I am building a farm style dining table with pecan 2″ thick X 8′-0″ long boards. The lumber was recently milled, although the tree had been cut months, years ago. What should be the approximate Highest MC to prevent wood problems to include finishes? The typical moisture content for hardwoods that will be indoors is 6-9 percent. You will want closer to 6% in the drier climates and 9% MC for the more humid climates. Either one should be acceptable for finishes. It’s always a good idea to check with the manufacturer of the finish also. We just bought a home where we discovered the plumbing was leaking over a number years with a kitchen flood occurring in the last 3-5 years due to a busted water line. The water wasn’t properly dried and organic growth was discovered by previous owner. Instead of addressing the plumbing and damaged wood, they installed a dehumidifier in 2015. The home inspector failed to report all the sewage stains on the plastic and organic growth on some of the joists have which had been exposed to moisture the whole time even though the dehumidifier has been mitigating the plumbing leaks. A company sealed off the foundation vents and removed all the insulation from the crawlspace with the humidifier mitigating the moisture from the leaks. Since the cold weather has come on, the organic growth has gone dormant, but a contractor noticed joists with distinctive moisture content where there are definitive separations between dry and wet looking wood. However, the company who maintains the dehumidifier said he tested some of the joist which he said only registered 10 on his device. I don’t know what to believe except the company who installed the vapor and dehumidifier said the vapor barrier needs to be changed out because of all the sewage and drainage stains after the plumbing is fixed. One of his own service guys said foundation caps needed to be replaced. Wonder if they are trying to cover themselves. Live in Tn. The plumbing was improperly installed with the wrong cement to fit the pipes and could have been leaking from anywhere between 5-29 years while absorbing into the ground. Any opinions. If the water leak was bad enough, dry rot can occur causing possible structural integrity issues. Did the Contractor mention anything about the structural strength of the joists? Thanks for the reply. There are joists that display splitting. We haven’t gone any further since the condition was found so close to us purchasing the home. So we are seeking redress, but there are jacks present underneath the home which the home inspector didn’t report either and didn’t know if this was extra support for the water heater or what. There are areas where organic growth was very active to cause deep, black discolorization. I will get further testing from those not involved. Thank you. I have 1 1/2 ” thick cherry boards that I had milled from a tree in my yard last fall. The moisture ranges from 11% -16% according to my meter. What % does it have to get down to before it would be usable to make a table top ? Furniture grade wood is typically dried to a target of 6%-9%. I found your moisture levels column through a search for “good wood for low humidity”. I think that I know my own answer, but thought I might reach out for some possible better insight. I have built two table tops (douglas fir) that have both suffered major cracking in their final location. I built the tables in west Texas, but their final home is in Colorado. Both times, the tables were flawless, but after 2-3 weeks in their new home both table tops had major crack issues. We found out that RH at the final location was under 20%. RH where they were built is about 29-30%. We are very arid where the tops were built so I figured the tables would be just fine knowing that it is arid where they were going…but that doesn’t seem to be the case. Allowing the wood to acclimate in the final spot before building, really isn’t possible because it is 8 hours away, and I can’t take a week off to go up there and build the table. Any suggestions to this being possible to correct? Different wood? Different joinery (currently using pocket holes)? Hello Brian, I am a moisture meter expert, not a woodworking expert but from your description, the problem points to the conditions, not the wood or joinery. Wood is a hygroscopic material, meaning it picks up or loses moisture based on the ambient conditions. There is only so much moisture a piece of wood can give up, over time, before a failure occurs. The failure in your case sounds as though the piece was exposed to a rapid loss of already low ambient moisture, causing the cracking in the piece. The optimal humidity in a home is generally 35%-55% and anything under 20% is actually considered unhealthy, as it dries out the skin. It does the same for wood, and is especially hard on softwoods, such as pine or fir. It is not uncommon for wood to expand or contract as much as a 1/8” per foot of width, so maintaining a stable environment is important. If the conditions are too wet, dehumidify, and if they are too dry, humidify. I strongly recommend using a moisture meter, along with a thermo-hygrometer, or even a smart logger before you start building, to ensure the wood is at an optimal moisture content in an environment that has an acceptable relative humidity and temperature range. These tools will give you the confidence that you have done everything on your part to ensure the highest quality in the piece you have built. Here is a link to our moisture meters, thermo-hygrometer, and Smart Logger. Thank you for your very informative knowledge about all of the items on this page. This summer I milled several 1.25″ boards from a fir log that had been cut around 10 years ago. Moisture was around 25% when milled, and the ends were sealed. The boards have dried nicely so far with minimal warpage or checking. They are currently nearing equilibrium (around 12 MC) and are stored within the house. My plan is to make a wall-mounted headboard out of angle iron and these boards (boards will not be joined). My question is regarding finishing. I have used spar urethane as a finish on a few other 12 to 18 MC (semi-wet) log projects that turned out wonderfully. However, this time I was planning to use oil based poly rather than the spar urethane to reduce the amount of yellowing. One of the beauties of spar is that it allows the wood to move quite a bit, while still retaining good adhesion. Do you see any dangers of using poly with a MC of around 12, or am I risking adhesion failure – especially if the wood does end up shrinking dimensionally? The angle iron will prevent much warping, and I do plan on finishing all sides (and ends). Thank you so much for your time and expertise. The manufacturer of the oil-based poly should have a specification on the maximum allowable moisture content of the wood. Question: Just to make sure that you get accurate moisture measurements, has your moisture meter been checked for calibration? Thank you for your help and any advice! Treated wood is typically still wet when it’s delivered to the job site. As it dries, you should expect slight changes in width and length. As lumber dries, it may split, cup and warp. This is more likely to occur to occur in lower-grade boards, where knots and uneven grains are already present. Each piece of lumber is unique and carries physical characteristics that may include the following: knots, warping, shrinkage, swelling and/or splitting. The normal outside equilibration moisture content (EMC) for Indiana is anywhere from 13% to 16%. There will most likely be some shrinkage, so if possible, choose the clearest boards possible to lessen the possibility of any major cracking. I dialed the 800 number for Wagner meters and all I got was two sales pitches for a Life alert type device. The other was for a $100 retail gift card. I wanted to talk to someone at Wagner about moisture guages and is there a dealer near Chattanooga, TN. Oh no! We’re so sorry for the inconvenience. 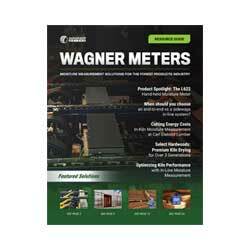 Please give us a call at (800) 634-9961 or email info@wagnermeters.com, if you’d prefer. Also, please feel free to provide us with the number that you called so we can make sure that all of our phone numbers are printed/posted accurately! So a friend of mine has some pine and oak blabs at MC levels of (oak – 11.5%) and Pine 13-14%. Now would the pine be okay to use as a top cover piece to an radiator cover? if not, can you tell me why? Second, would the same pine slab, would it be okay to use for a side table or Kitchen island. I have come across this and haven’t made the purchase from my friend because I am not sure about the warp or breaking it will come. As with any wood product, the environment where the finished product will “Live” will determine the correct moisture content. Moisture content of 11.5% for the oak is a little high for furniture grade hardwoods. Again, the correct moisture content will depend on the surrounding conditions. Wagner has a free app called “WoodH2O” to help you determine the proper moisture levels based on consistent humidity and temperature. I am from Bangladesh. Here current humidity is 76%. What would be the recommended MC for doors of my new building(under construction)? If the humidity is a constant 76% then the wood will equilibrate between 14 and 15% moisture content. Toilet overflowed and moisture meter is reading 30% in worst area. Can carpet be reinstalled? Before installing carpet, you will need to dry the subfloor first. If your subfloor is a wood product, make sure the reading is less than 20% on the moisture meter. Also, if the leak was bad enough, it will be necessary to have a contractor make sure the strength of the subfloor isn’t compromised. Hi, in MN where extreme temperatures are very hard on homes. What do you recommend the reader to be at before insulation and drywall on new construction? We have had very bad cracking in sheetrock and floors.